If you are serving this at a dinner party, it's a good idea to prepare ahead by making the sauce just before everyone sits down for the starter, keeping it warm in a Thermos flask until you are ready to serve. Place the ginger, shallot and lime juice in a small, non-corrodible saucepan. Boil over a medium heat until it has reduced to about a tablespoon of liquid. Add the double cream, season to taste and set aside. Preheat an oven-top griddle pan over a medium-high heat. 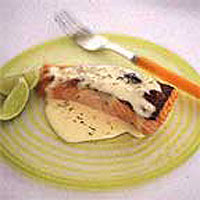 Brush the salmon fillets with the olive oil and season with salt and freshly ground black pepper. Place the fish, flesh- side down, in the pan and cook for 3 minutes, then carefully turn it over and grill the skin side for 4 minutes or until the fish is just cooked through. Meanwhile, bring the lime liquid to the boil, then reduce the heat to a low simmer and gradually whisk in the butter, one piece at a time, so that it emulsifies as it melts. Do not let it boil, or it may split. Remove and serve immediately with the fish. This is delicious with spinach or purple sprouting broccoli and a dish of new potatoes.